The Bosfor is an overnight train from Bucharest to Istanbul, with a detachable portion that goes instead to Thessaloniki in Greece. I found out about it thanks to a man named Mark Smith, a British railway enthusiast with a fantastic online list of interesting rail journeys and how to book them. The Bosfor rolls out of Bucharest at around noon, ambles across the Bulgarian border in the early afternoon, and spends of the rest of the day and night crossing Bulgaria and the European piece of Turkey before reaching Istanbul’s main train station early (in theory) the following morning. Long-distance trains leave Bucharest from the Gara de Nord, a surprisingly uncrowded station well-stocked with sandwich kiosks, beverage stands, and old women selling knitwear on the platforms. There is even a vending machine that sells French fries. The train rolls in right on time, looking magnificent with its menacing Turkish Railways logo on the lead engine, and my traveling companion and I climb aboard the designated sleeper car that will be our home for the next day. It is my first time taking a sleeper train with a compartment of my own, with no snoring strangers to listen to or unfamiliar feet to step on, and I am enormously excited. The compartment is a tiny, immaculate space full of fold-out cabinets and secret hinges of the kind I have loved playing with since early childhood. It has been set up with two bunks (though it’s possible to rearrange it to sleep one or three), above which is a canopy of hooks and baggage nets for securing cargo. The bunks have been made up with pristine white bedsheets, and at the foot of the top one, exactly where you might hook your toe when stretching out on the bed, or place your hand when steadying yourself in the doorway, or perhaps reach up and grip while seated on the lower bunk and having a stretch, is an emergency brake handle. For the next twenty-four hours I will find myself struggling with the temptation to grab this and pull it, and finding my hands and feet in suspicious proximity to its irresistible knurled grip whenever I let my thoughts wander. The train has to circumnavigate most of the capital before it can turn south. There is not much in the way of suburbs around Bucharest; after a brief interlude of dirty residential blocks the city disappears into a brown smudge on the horizon and we pass through long stretches of fields and small stands of trees. In another hour these have resolved into a dry plain thickly forested with concrete utility poles of uncertain purpose, laid out in a dense grid. 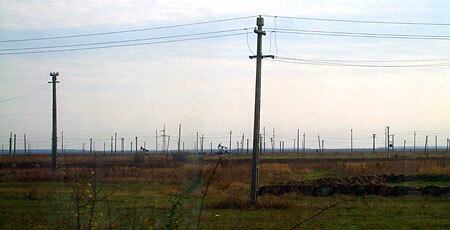 Soon little oil derricks begin to pop into view in between the utility poles, pumping away. Every few kilometers there is a siding with a messy tanker railcar that looks like it has been filled with tar. As the train clatters through Romania, people begin to wander out of their compartments and explore their new habitat. There is no dining car or other area to socialize in, but the car we are in is convival. Our immediate neighbors to the left and right are matronly Romanian women; down the hall is an Australian couple on what appears to be a world tour. A sulky Romanian conductor sits in a kind of jump seat near one end of the car. A sign above his head promises that, if asked, he will sell passengers potato chips and hot tea. This conductor will roam the car stone-faced for the duration of the journey, never returning a smile when checking tickets or documents, but somewhere in Bulgaria his cell phone will ring and expose him for the big fat Enya fan he is. Right now, he still seems intimidating. With the sun already descending in the sky the train reaches the Romanian border. There is a brief stop for exit formalities, and then we are on our way way across the enormous Friendship Bridge into Bulgaria. The Danube plays tricks here, pretending to be a small river until the train has crossed a wooded island, where it reveals its full Mississippi-like breadth and an enormous, backlit Mad Max panorama that extends as far as the eye can see on the Bulgarian shore. In Ruse, the industrial wonderland across the river, the train takes its first long rest. Semi-official Bulgarians amble along the sides of the cars with metal spikes and hammers in hand, perhaps looking to drive a stake through the heart of any Romanian vampire they find still clinging to the undercarriage of the train. Meanwhile, border guards have entered the car and are making their way down the corridor, rapping on doors to check passports. I hand mine over first. “Polska? Polska OK.” says the lead guard. Then he starts in on my traveling companion’s American passport — one of the new kind with the highly embarrassing pages of amber waves of grain, giant eagles with a single tear in their eye, moon landings. He flips back and forth for an uncomfortably long time before summoning his colleague, who comes up the little hallway of the sleeper car with a heavy step. “This is your passport?” he asks. The two guards exchange glances. “Happy birthday!” the first guard says. “Jubilee!” adds his colleague, noticing that it’s a round number. How times have changed! Where is the surly glaring, where is the hospital-like interrogation room with the slowly rotating ceiling fan, where is the big Bakelite rotary phone used to call headquarters, where is the embarrassing and intimidating demand to completely unpack every suitcase? Here we have just crossed the Friendship Bridge, a summit of high Stalinism, and yet the border guards don’t even have the right to look in my suitcase. Seeing the pleasant blue European Union flag flying on either side of the bridge is disconcerting to me; it’s as if I had come across a road sign in rural Alabama marked in kilometers. And in a couple of years, once Romania and Bulgaria are in the Schengen zone and border controls are dismantled, it will only get weirder for codgers like me. I don’t learn much about Bulgaria through the window other than it’s a good place to be a lawn. Long stretches of crayon-green hills alternate with meditative, tranquil intervals of quiet reflection spent standing motionless on a siding. The sun goes down not long after we’ve left Ruse, and pretty soon the train is either moving through complete darkness or standing in the harsh light of some railyard or other. Around four o’clock in the morning we make it to the southern border. More Bulgarians climb aboard to check passports, making sure that no one has changed nationality in the preceding twelve hours, and then the train rolls into Turkey. The Turks have a gorgeous flag, inherited from the Ottoman Empire, and they know how to show it off. An enormous specimen, the largest flag I have ever seen, stands right by their border post lit up by a special floodlight. It makes an impression. Later we’ll discover that oversize flags are something of a Turkish specialty, and make beautiful punctuation marks in the Istanbul skyline, but nothing will approach the drama of this monster at the Greek and Bulgarian frontier. Adding to the drama, we are at crossing a former Cold War border, so the train has to glide through a formidable no-man’s land of barbed wire and decaying concrete buildings, including a watchtower the size of a small restaurant standing on one long concrete leg, like a malevolent mushroom. The Turkish authorities make us get off the train to buy a pretty visa stamp for twenty dollars, and there descends that four-in-the-morning anxiety you can only get standing a few hundred feet from a train with all your belongings on it. But despite some ominous whistling and hissing from the brake lines, the train will stay put for hours. The Bosfor does not lightly squander an opportunity to do some standing around. Back inside I discover that the emo conductor has been lured into conversation with one of the Romanian matrons and broken into a winning smile. They stand at the window talking smack about the passengers filing back from a little duty-free kiosk. Long after everyone is asleep again, the train finally lurches into motion and starts the final segment of the journey, through mysterious Thrace. In theory, the Bosphorous arrives at Istanbul at eight in the morning, but the many hours of standing at sidings in Bulgaria are not on the schedule, and the actual arrival time is closer to one in the afternoon. We wake up to cloudy skies over Thrace, the European portion of Turkey, which looks suitably exotic. The hills are dun-colored and sparsely populated compared to Bulgaria. Here and there are dirt roads or an occasional village with a minaret, looking like a blue and white rocket with four loudspeakers attached near the nose cone. In other places are groves of trees, or long stretches of apparently unused land. Shepherds and beehives recur in about equal numbers - that baklava has to come from somewhere. In the small towns we see Turks going about their morning business, sweeping stoops, small Turks heading to school, grown-up Turks waiting for a bus. Finally the train rounds a set of hills and enters a Legoland of colorful, brand-new housing projects sprouting directly out of pastureland. For another hour this turns into progressively denser city, the train skirts the edge of Ataturk international airport, and then abruptly come the gorgeous ruined striped walls of old Constantinople and we are in Istanbul.